Tom's of Maine Natural Deodorant is among the more popular natural brands. Currently, it is hanging out at 3.8 stars on Amazon, and while there are a few negative reviews, the general consensus is that this stuff actually works. So, let's get right into it and see what's what. Tom's of Maine Natural Deodorant is a stick style deodorant. This is actually more important that you may think. There are many different styles of natural deodorant, ranging from the traditional stick, all the way to a tallow. Sounds like a weird thing to put on your underarms right? You're not wrong, but it is surprisingly effective. Most people are more than used to the stick deodorant so this is obviously the most popular choice for people just getting into the natural deodorant game. Plus it is pretty much the best overall choice, as it both deodorizes and absorbs sweat well. Many natural stick deodorants are usually made up of a form of natural oil or butter, like shea butter, along with baking soda, or one of the other natural absorbents, and essential oils for the fragrance. In fact, there are several essential oils that are antibacterial by nature, like tea tree oil or neem oil. When you take a peak under the hood, you will find a bunch of good stuff. However, you will also find some things that Tom's of Maine has added that are typically left out in other brands. Nevertheless, they are all natural. 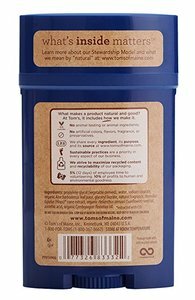 The full list of ingredients in Tom's of Maine Natural Deodorant are as follows: Propanediol (vegetable derived), water, sodium stearate, organic aloe barbadensis leaf juice, zinc ricinoleate, glyceryl laurate, natural fragrance, humulus lupulus (hops) cone extract, organic helianthus annuus (sunflower) seed oil, ascorbic acid. As you can see, there are a bunch of oil and plant extracts. Tom's of Maine actually is very transparent about their ingredients and lists them, their role in the product, and their source, all on their website. For example, one of the ingredients often left out in most other natural deodorant brands is propylene glycol (propanediol). However, this is still not a synthetic ingredient, as many other brands use. This form of propylene glycol is derived from vegetable oils and not synthetic at all. One interesting ingredient is the hops. Here Tom's of Maine Natural Deodorant uses them to eliminate your body odor. Obviously, if you are searching for a natural deodorant, you are trying to avoid a few things. With Tom's of Maine Natural Deodorant, you will be avoiding any and all aluminum, artificial fragrances and preservatives, and any animal ingredients. In addition, this natural deodorant is also cruelty free, which means that it was never tested on animals during its production. In terms of how well it works, well it seems that this stuff is actually pretty effective. Various reports have raved about how well it works. Even the negative reviews have said that it actually worked for them, but their complaint was of a different nature. Now, Tom's of Maine does more than just toothpaste. Their natural products range from oral care, to deodorants. They have a wide range of deodorants, that vary in scent. All of them are free of aluminum, artificial additives, and animal testing. Tom's of Maine Natural Toothpaste is made in such a way that it is easy to convert from regular deodorants to natural. The stick design makes it comfortable for the typical consumer, as they are most likely already used to that design in commercial brands. Everything inside Tom's of Maine Natural Deodorant is naturally derived. Even their propylene glycol is naturally derived and not synthetic, unlike most commercial brands. The stuff inside Tom's of Maine Natural Deodorant actually works. The addition of hops make for effective odor elimination. Keeping you free of BO throughout the day. Other ingredients are added for their antioxidant properties like the ascorbic acid, which is derived from citrus fruits. Tom's of Maine Natural Deodorant makes it easy to avoid any harmful additives. This natural deodorant is free of all aluminum, artificial fragrances and preservatives, and any animal testing. The company, Tom's of Maine, is very transparent when it comes to their ingredients. On their website, they list each and every ingredient for each product, tell you what its role is, and where it came from. Many reports from customers who had complaints had very similar complaints. Most of the negative reviews revolved around the deodorant giving them skin irritation or rashes. However, with the lack of baking soda, as that is the most common reason for skin irritation, I am unsure of what could be causing the irritation. While there are a good amount of customers complaining about skin irritation, it is hard to zero in on what exactly is causing that. It is possible that the irritation is actually an allergic reaction to the hops, but that may be a far reach. Nevertheless, even the negative reviews had said that this deodorant was working for them. Keeping them dry and smelling good. So as long as you are not sensitive or allergic to any of the ingredients listed here, you should be good to go. Tom's of Maine is a great company that has a relationship with a not so great company. However, they have not succumbed to the pressure of adding cheap and synthetic ingredients into their products to make them more appealing and to extend self life, so that's great. Overall, Tom's of Maine Natural Deodorant looks like a really good and effective natural deodorant. As long as you are not sensitive to any of the ingredients, you should find this to be a good choice. So, if you want to grab a 2.25 ounce stick of Tom's of Maine, you can find it on Amazon for $4.27. For more information regarding the best natural deodorant or anything else, head on back to Green and Growing. Here are some top questions that I found for people seriously considering buying Tom's of Maine Natural Deodorant. Is this deodorant clear or white? It is more clear than white. Is this deodorant made just for men? Obviously some scents will appeal more to men than women, but either gender can use this. Is this a solid or a gel? This deodorant is a solid.